Again, Jesus’ radical claim to be the way, and the truth, and the life, and that no one comes to the Father except through him means that you, as a believer in Christ, have access to the Father through Christ. Right now. In this section we will examine the Christian Mandala shown below. In the next section we explore Hebrews 10:19-22 in order to understand Jesus’ claim from the perspective of the Old Testament. The mandala has two realms. The first realm is the four dimensional universe in which we live. In this realm we see a man crouched over. On the periphery of the large circle, still in the first domain, we see a drop of water, a watch, planets, and a nebula. This region feels dark and empty. The second realm falls within the circle. Jesus is in the center. Near him are 24 angels, a chalice, and a piece of unleavened bread. Behind Jesus is the right hand of the Father. This realm is bright, colorful, and has a sense of motion. A cross surrounds the portal between the two realms. Jesus is the one who opened the portal by his work on the Cross for us. He is the door of the portal; the way through the portal. As the author of the Book of Hebrews puts it, using my language, Jesus opened for us a new and living way to the Father through the tearing of his flesh on the cross. At the entrance to the portal between the two realms we note a chalice and a piece of flatbread. 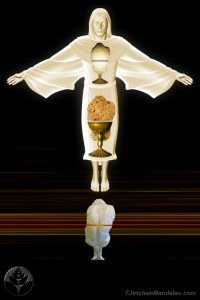 The bread and chalice represent the body and blood of Christ, torn from Christ’s body on the cross, and placed before us. The shape of the hole created in the body of Christ by the tearing of his flesh, is repeated in the shape of the chalice and bread. Through the opening in Christ we see the Father’s hand. Access to the Father in made through Christ. A new believer, represented by the man crouched over, has heard the call of Christ and responded. . He is humbled, repentant, and has realized his need for Christ. He deeply embraces the offer of Christ, so much so, that he takes on the shape of the bread and the chalice. In his brokenness, and in his embrace of what Christ has done for him on the Cross, he can now move spiritually, from the first realm into the second realm. He will be made whole. 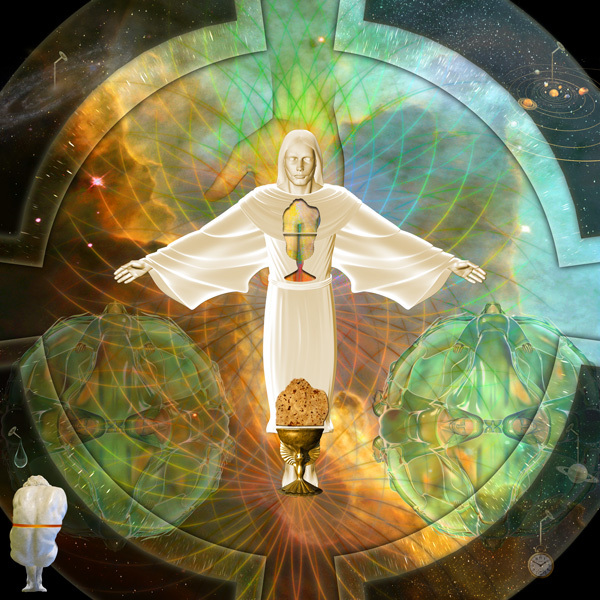 Put another way, by taking on the shape of the bread and chalice, I am showing the new believer accepts the work Christ has done. He then is able to pass through the door, the flesh of Christ, into the hand of the Father.